It is possible for political correctness to destroy a country, particularly one with as contentious a history as South Africa has. 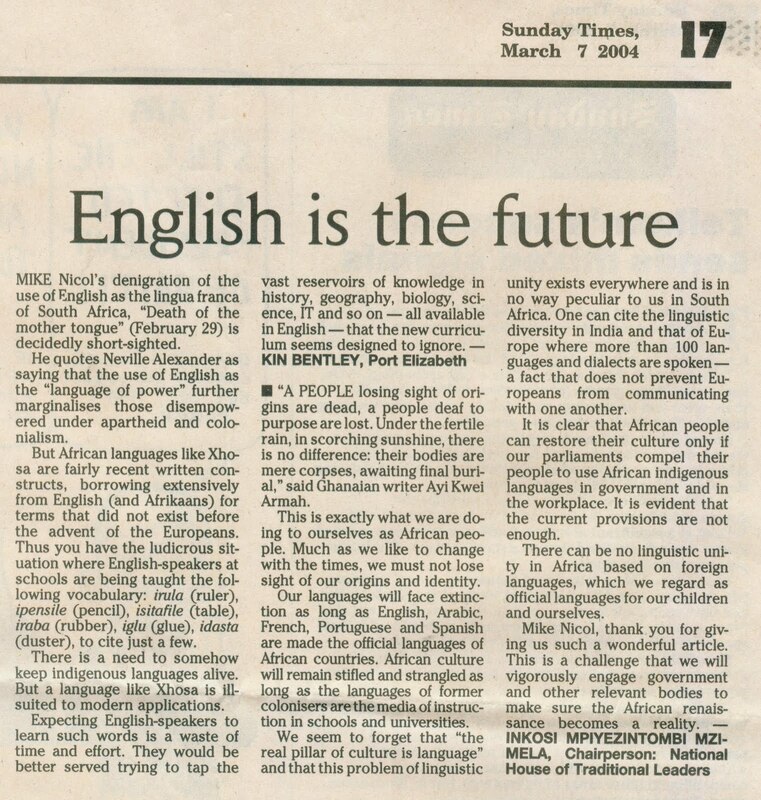 I was a critic of the ill-suited outcomes-based education from the start (and it failed), and was quick to respond to another pie-in-the-sky plan regarding the use of African languages. My letter on this issue appeared in the Sunday Times, with a response the next week. 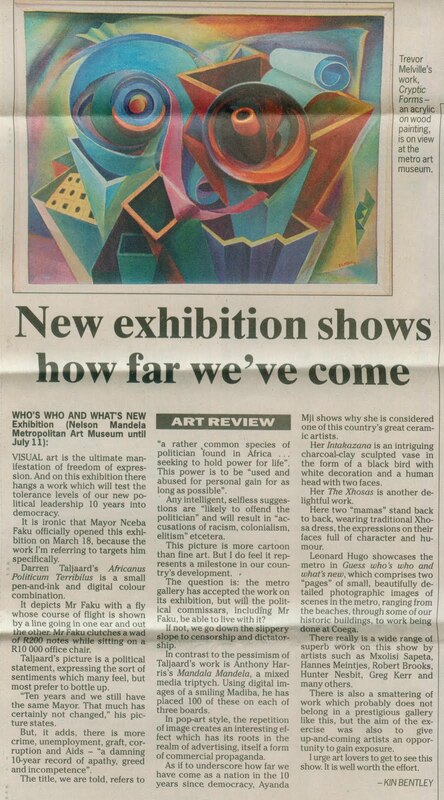 This segment also includes a couple of art reviews, a few letters based on issues leading up to the 2004 elections and another dig at the communist, Jeremy Cronin. 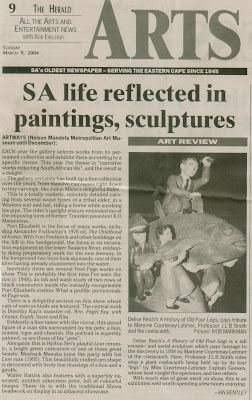 Over and above working as a reporter and then a sub-editor on the Herald, in Port Elizabeth, from about 1993 till 2010 I was the art critic. 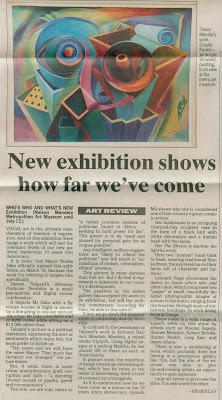 I often brought present-day issues into my reviews, like this one from March, 2004. 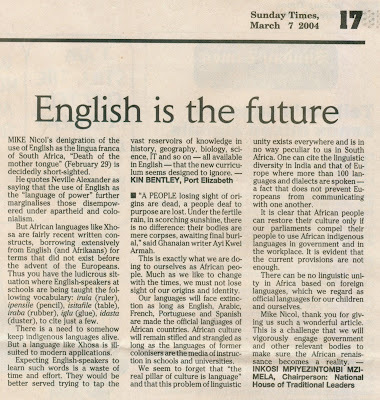 A letter in the Sunday Times of March 3, 2004, disagreeing with my views on language. 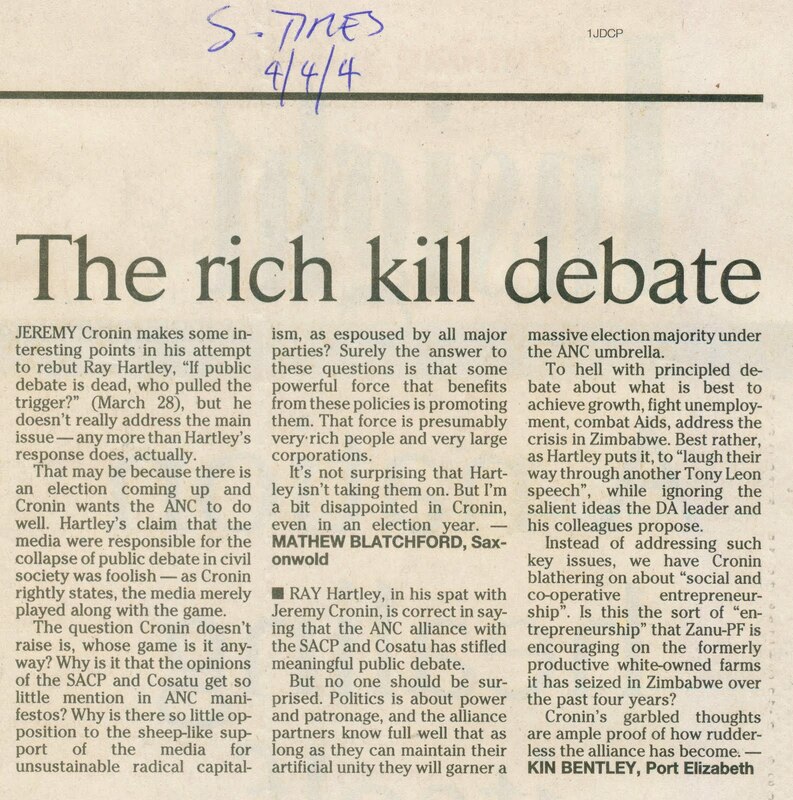 The blurring of state and party was the subject of this letter, which appeared in the Herald on March 15, 2004. I first met Max Mamase when he worked for Van Zyl Slabbert's Institute for a Democratic Alternative for South Africa (Idasa) in the mid-1980s. Like so many other struggle veterans, he was seduced by the perks of political office post-1994. My review of a major exhibition at Port Elizabeth's premier art gallery, which appeared in the Herald on March 25, 2004. 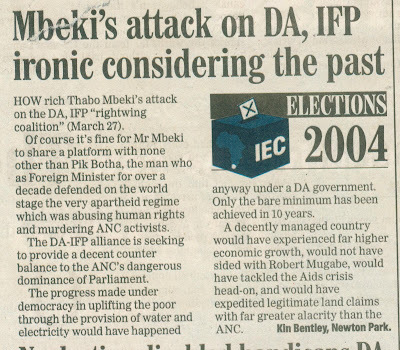 Another letter, this time in the Weekend Post, during the 2004 elections. This appeared on April 4 of that year. 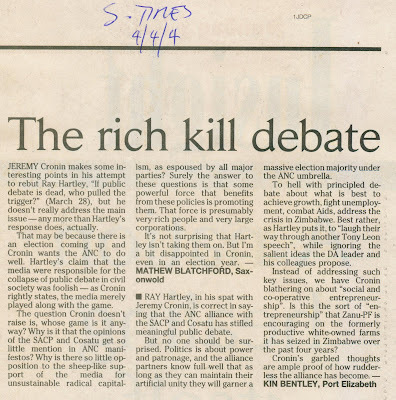 My dig at the 0h-so-self-righteous Jeremy Cronin. 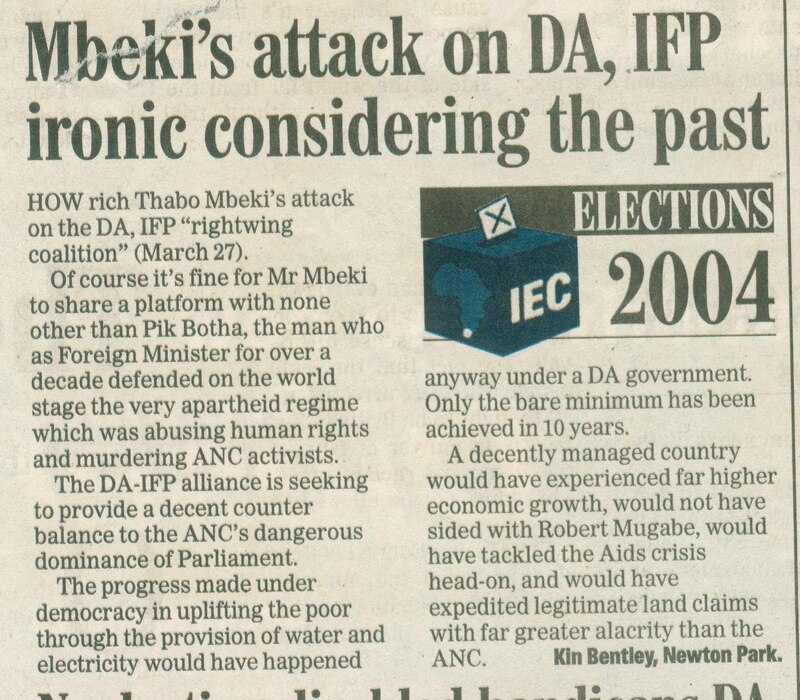 Another letter I had published in the Herald attacking the ANC.